Sweetwater Pointe is not the kind of community known for kicking up the dust. Nestled off Old Floral City Road just south of Inverness, Sweetwater Pointe features 55 upscale homes on spacious lots, where sandhill cranes wander the yards. But a resident’s attempt to change a dynamic of the quiet neighborhood has some people up in arms — and on the doorstep of Citrus County government. County commissioners on Tuesday will be asked to take sides in a debate of whether to allow golf carts on streets in Sweetwater Pointe. Resident Sam Arnold presented the county with signatures or 28 homeowners who support golf cart use on community streets. But the Sweetwater Pointe Homeowners Association is saying Arnold didn’t follow the proper protocol, and commissioners should ignore Arnold’s petition. Sweetwater Pointe is an upscale community of 55 homes between Inverness and Floral City. One commissioner is all too familiar with the issue. Kinnard knows. He has owned property there since 2001 and will not be participating in any board vote that may take place Tuesday, even though Kinnard’s home is set for a closing in May and he is now living in Crystal River. A similar effort was led in 2016, but the process was totally different. In that case, the homeowners association sent out mail ballots to homeowners. The result: 26 for, 15 against and 14 not returned. Frank Bose, who has lived in the community since 1996 and is the association’s financial secretary, said rules at the time counted ballots not returned as “no” votes, so the 2016 effort failed. Since then, he said, the residents have amended the bylaws to simply not count ballots that are not returned. Arnold’s petition to the county notes there is a platted golf cart trail connecting Sweetwater Pointe and the Inverness Golf and Country Club. 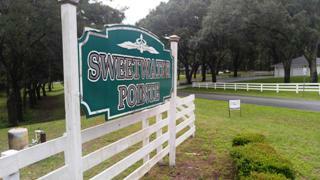 The only way for Sweetwater Pointe homeowners to access the cart path is through their community streets or venture out onto Old Floral City Road, he said. Bose said the association doesn’t necessarily oppose opening the streets to golf cart use, but that the question should be presented to homeowners in a formal fashion — through the association’s board of directors. Bose said that residents are already illegally driving golf carts on community streets.